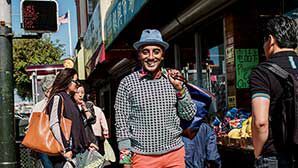 Travel + Leisure’s new video series B-Sides follows chef (and T+L food and culture contributor) Marcus Samuelsson through emerging neighborhoods in the U.S. that most travelers don’t know about. Like the “B-side” of a record album, these places are the flip-sides to a city’s greatest hits. In this video, the first episode of the B-Sides series, Samuelsson explores Inner Richmond, San Francisco, a collection of low-rise blocks just north of Golden Gate Park and a quick ride from downtown. During a day of fashion changes, eating local foods, and finding connections to his Swedish roots, the charming, super-stylish chef leads us through a funky, eclectic, genuine neighborhood that still feels undiscovered. First up, a panoramic view of San Francisco from the DeYoung Museum at Golden Gate Park. From there, it’s off to the Inner Richmond, where Samuelsson stops into Spices, a family-run Sichuan place, Good Luck Dim Sum, where a dish of delicious dumplings is just $2, and Village Market, for a quiet cup of coffee or a snack to go. Next up: shopping. Samuelsson picks Seedstore for Vans and Swedish Nudie jeans sold by friendly staffers, and Green Apple for cookbooks and vinyl records. Then he stops into Schubert’s Bakery, a neighborhood institution, where the baker offers up a Swedish Princess—a cake that was one of his childhood favorites. Watch the video and take a tour with T+L’s newest contributor and host, Marcus Samuelsson. For the complete article and guide to the neighborhood, click here.